Being a digital business owner can be lonely. We spend most days alone and in front of our computers. Then when we do get off of the computer or out of the house we end up talking to non biz owners (hello husbands and best friends) about our business problems when they can’t give us much or any feedback. If I hadn’t made a conscious effort to start making REAL friends (not just acquaintances) online, I probably would have quit my business by now, because it really does get that hard and feeling alone is not okay. If you’ve ever wondered how some people seem to know everyone, or have a close group of friends online, this episode is for YOU! Do you feel you can honestly say that you have made real friends online? Yes, hands down, 100%. Some of my best friends in life are people I met on the internet, and not just in business. I moved from West Virginia to Germany to be with my husband and making friends locally was really hard. I started making online friends before I even moved. I’ve also made friends through planning my wedding online, in parenting groups, and obviously business friends. I just don’t know where I would be without the internet! My story is similar to Jenny’s as I moved across the country straight out of college. I made a lot of online friends through Facebook groups and Twitter. Last year I travelled across the country twice to stay with my online friends I had never met before. Definitely. I feel like the people I have met online have helped my business but have also become real friends. I work full time so when I meet new people online, I really invest in it and take the time to get to know them. I’ve met a lot of people in person whom I’ve first become friends with online. You can definitely make real friendships online, I love it. Where has been the best place for you to find friends online? Most often in Facebook groups but it has also happened on Twitter and Instagram. When I look at back at different friendships that have happened, most of them started by helping each other out. Either by them asking me a question or me reaching out to them for help. I have a different twist on online friendships – rekindling friendships. I had a real life friend when I was younger but our lives ended up going separate ways. Once Facebook got bigger we started chatting again and when she decided to become an entrepreneur, that’s when our friendship really rekindled again. Facebook is where I’ve met the most people. I met my first ever industry friend through the Savvy Business Owners Facebook group and she only lived 20 minutes away from me. That friendship has just built over the last two years. As soon as someone says they are from Virginia, we are automatically friends! But just helping people out, sending them an email, commenting on their photos and posts – really making an effort helps build real friendships. How do you make the transition from just emailing to making phone calls and real life meet ups? The initial reach out always feel a little awkward. I am getting more comfortable with it now that I am meeting more and more people. If you comment a lot on people’s post it makes the transition easier as you have been communicating quite a bit beforehand. I don’t feel like there’s a certain time where you need to transition, it’s more when you feel that you like the person and you feel there’s a real connection there and you are interested in exploring that. 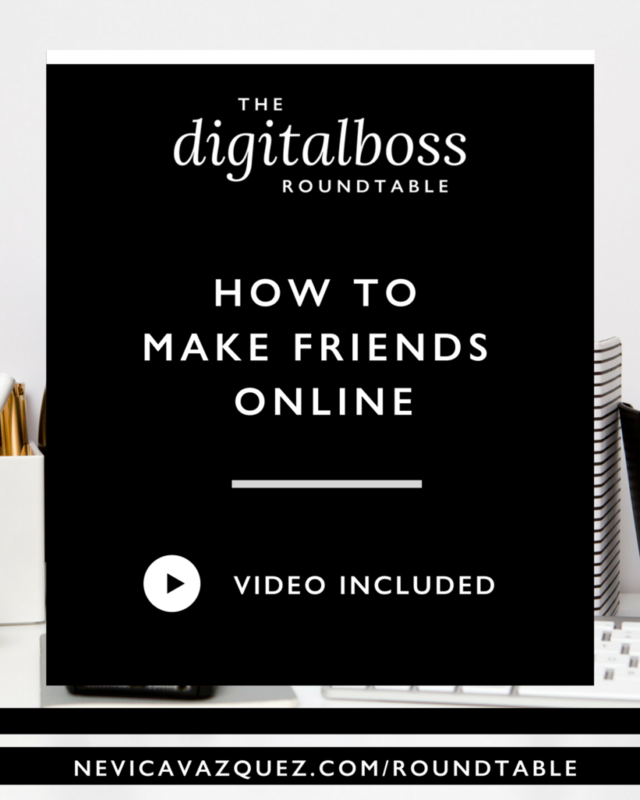 How do you nurture your online friendships? You really need to pay attention to what’s going on in people’s lives. It takes very little time to double tap on someone’s photo on Instagram or swipe up and comment on their Instagram stories – it shows people that you are there, listening and paying attention which makes people feel valued. That’s the best way to make friends.